Shoot fee - $100 plus travel expenses beyond 20 miles $0.45 per mile by car. Airfare, car rental and lodging plus additional $50 shoot fee for out of state shoots. Digital conformation picture and front and rear views provided on 8 X 10 flyer with 3 generation pedigree. Includes rights to make unlimited copies and post on equine sale websites provided signature included. Marketing package 2 - $500 Paid at time of photo shoot (includes shoot fee, but not transportation fee) plus 5 percent of agreed on reserve. 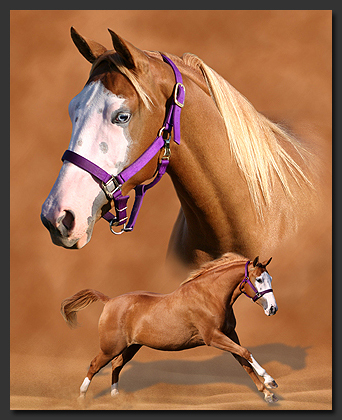 Digital picture, pedigree and descriptive paragraph posted on three horse sales websites. Detailed conformation analysis and breeding recommendations provided through Purple Power Equine Bloodstock Services. 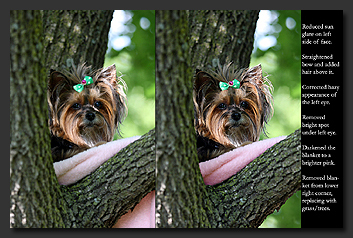 Photoshop editing from very minor to extensive (including ear fixes, background removal, collages, etc.) available on a case by case basis. Click the thumbnails below to see an example of a few fixes. Website design, creation and maintenance also available.